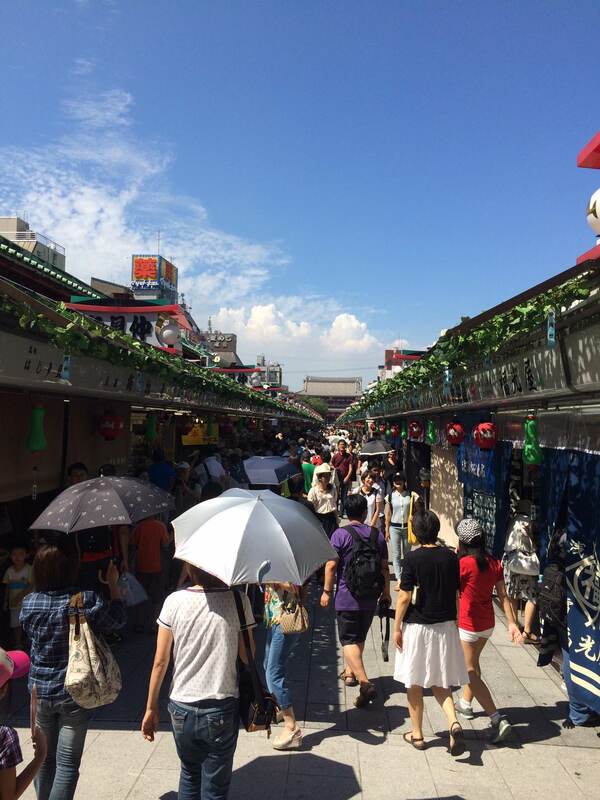 Welcome to Asakusa home of Tokyo’s oldest temple and the ‘Thunder Gate’ Kaminarimon! Being one of Tokyo’s most recognizable locations, Asakusa has it all, shopping, history, food and if the season is right, Japanese cherry blossoms. 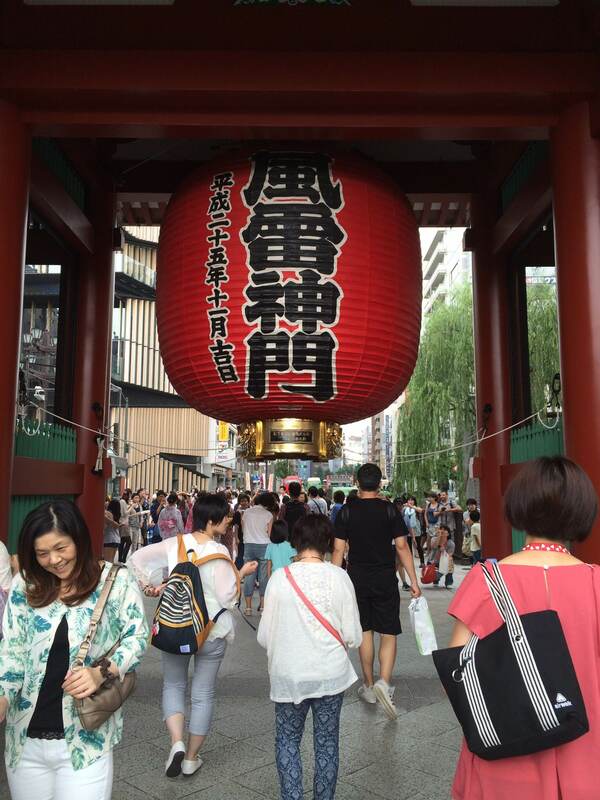 Starting with Kaminarimon, the 10m tall symbol of Tokyo itself, you walk through the hustle and bustle of Nakamise Streets’ 200+ souvenir stores towards Sensoji Temple. As you meander along Nakamise Street, make sure you keep an eye out for Japanese Maneki Neko (Beckoning Cats) that bring good business and good fortune! Also keep and eye out for people dressed in Yukata, one of the traditional garbs of Japan. You never know, they might even be nice enough to take a picture with you! As you reach the end of Nakamise Street, you pass through the second gate to be greeted by the majesty of Sensoji, Tokyo’s oldest temple. 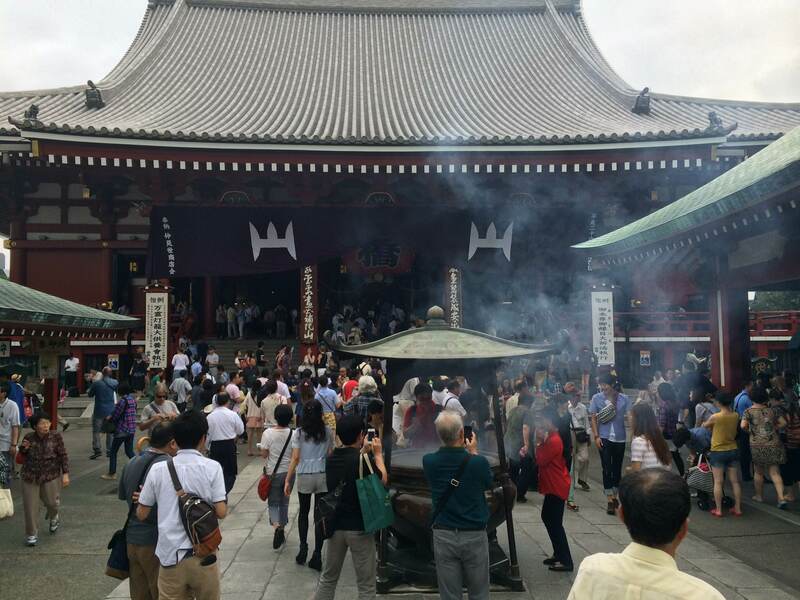 For a small fee of around 50 Japanese Yen you can purchase incense to burn in front of the temple entrance. When burning incense, light the sticks for a few seconds then extinguish them with your hands (Rather than you mouth) and make sure to fan some onto yourself as it is said to be purifying and healing! Then, after rinsing your hands in the clear waters of the purifying fountain, you can enter the temple itself to take pictures of make a prayer to the Kanon statue Bodhisattva, Goddess of Mercy. In Japan to make a prayer, you throw a coin in the donation box, bow twice, clap twice, say your prayer (inside your head) and then bow once more. From certain vantage points, you can also see Japanese newest addition to it’s already substantial Skyline, the Sky Tree Tower, the worlds largest Telecommunications tower. So bring your good camera and your new lens because you will have many opportunities to snap shots of both new and old Tokyo together. So what are you waiting for?! Hop on a tour and come see the glory of ancient and modern Japan for yourself! It’s finally July and the Japanese rainy season is almost over, only to be replaced by the summer heatwaves. The Japanese summer usually ranges from the start of July to the end of September. 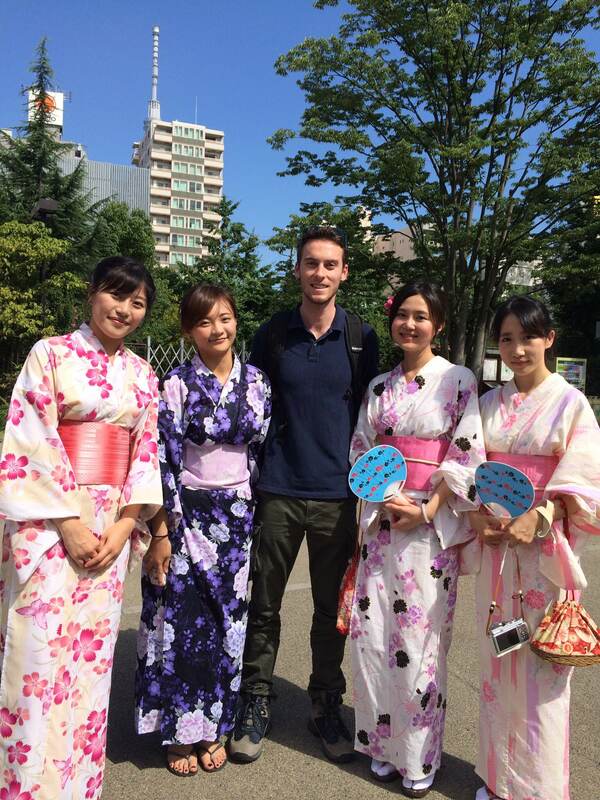 In this blog I’m going to give you some advice on how to prepare for a Japanese summer. A summer survival guide. As a traveler, I understand that you might not have that much space in your luggage, but here are some pointers on what you might want to consider adding to your packing list. First and foremost, Japanese summer is hot. Very hot. And humid to boot. So bring appropriate clothing. A hat, sunglasses, shorts, T-shirts sandals and anything else that is breathable is recommended. Unless you want to turn into a walking waterfall. Also there are Uniqlo shops everywhere in Japan that sell reasonably priced, breathable summer wear. Unfortunately the humidity can equal bugs. So if possible, bring some mosquito repellent from home. If you forget to bring some you can ask for it at a regular Japanese drug store. Mushi yoke kudasai = Can I please have some insect repellent. Keeping cool is important, but keeping safe is even more so. Nothing is more important to us at TAS than your safety and enjoyment. So when on tour, bring sun protection! In Australia, we have a saying ‘Slip, Slop, Slap. Slip on a shirt, slop on some sunscreen and slap on a hat’. Bring all three and you’ll be well on your way to a safe and comfortable tour. In addition to this, please drink plenty of water. No one wants to be dehydrated, sun burnt and feeling anything but 100%. 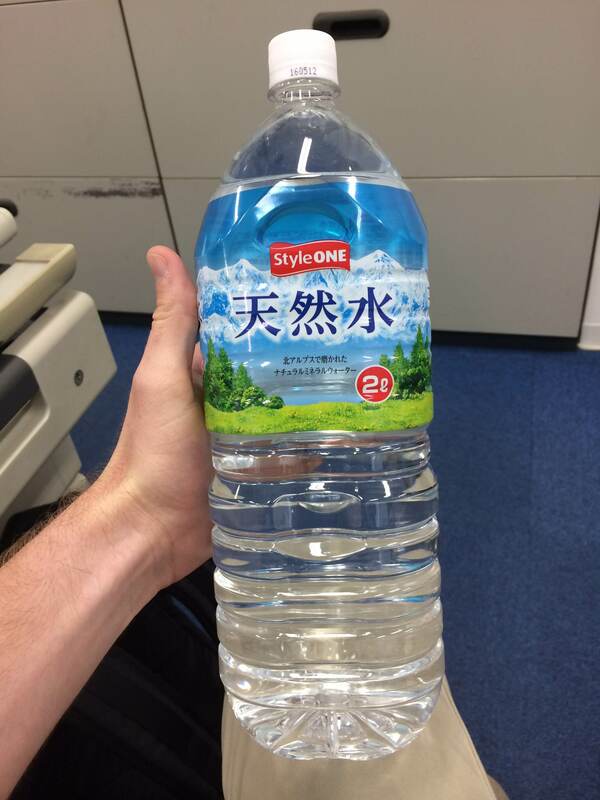 You can buy big 2 liter bottles of water for about $2 US and the tap water in Japan is perfectly safe and drinkable. So refill, refill, refill. Due to the humidity, you will sweat. There is no helping it, it’s going to happen. The buses TAS uses all have air-conditioning, however you will spend most of your time outside. So when over here, you might want to invest in some moist wipes to wipe away any sweat or grime that might accumulate during the day. Hopefully these little tips will help to make you tour more comfortable and enjoyable during the hot summer! Yokohama – By the Seaside! 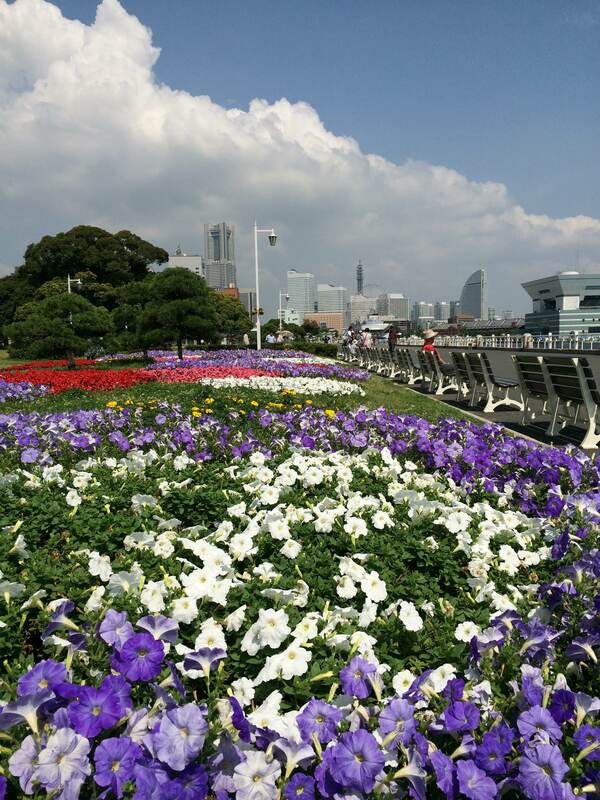 Yokohama (横浜ーよこはま） is one of our hit attractions in the Kanagawa region! It boasts one of the largest ports in Japan as well as the largest China town (中華街ーちゅうかがい）! Around 40 or so minutes from Tokyo’s CBD by bus, Yokohama moves at a slower pace than the always hectic Tokyo metropolitan area. 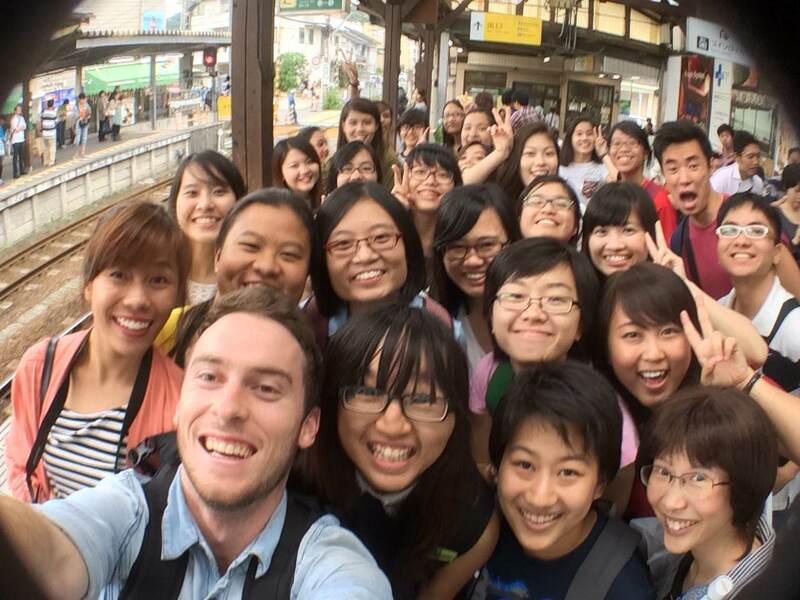 I have just returned from leading a custom tour from Singapore! 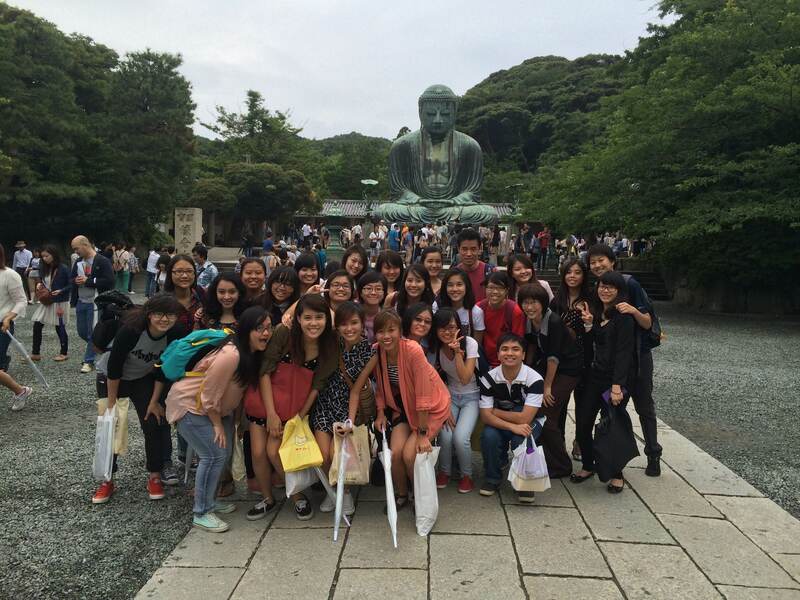 I had the pleasure of guiding a group of excited young diploma students right here in Yokohama for a week. As the students came for an Occupational Therapy Convention time was limited. However, we managed to run around to Kamakura to see the giant 13 meter tall Buddha statue located in Kamakura (Photo below), as well as take bus in to Central Tokyo for a day trip around the famous sights. Yokohama is famous for its class, its shopping and interesting fusion of western and eastern architecture. The Red Brick Warehouses (On the left of the Panorama photo) are perfect examples of all three of these. Originally a customs house for imported goods built with the western style red bricks, Akarenga is now filled with classy Cafes, shops and surrounded by parks. A short 5 minute walk down the road and you reach Takayama Park located right next to China Town. The park is home to beautiful flower gardens and the occasional groups of Chinese expats doing their daily Tai Chi. Of course, continue walking for another few minutes and the arrive at China Town itself. Weather its a weekday or weekend, Yokohama China Town is always alive with activity and festivities. With hundreds upon hundreds of shops as well as museums and the occasional festival, there is never a dull moment in China Town. But this isn’t all Yokohama has to offer. There is the Neova mini theme Park, the Landmark building, river cruises, and even a ramen museum where you can make and take home your very own instant ramen! So look forward to a trip to Yokohama. When was the last time you had an adventure!? When was the last time you got out of your comfort zone and experienced something new, inspiring and exciting!? That’s where I come in! My name is Tom Lewis. I’m Australian, 23 years old and I work at TAS as a tour guide. I personally have always had an addiction to traveling. Despite my age, I have visited most continents and seen a variety of cultures. Since I started working as a TAS tour guide, I have been given the opportunity to quench my thirst for adventure and travel to all corners of Japan. So for those of you out there that share my spirit of adventure I have some good news. I am going to post blogs and photos about where I have been with my tours in the hope that it will give you, the ‘future adventurer’, an insight into what a tour with TAS is like. I look forward to taking you on my virtual tour around Japan, and hope to see you soon on one of my REAL tours! 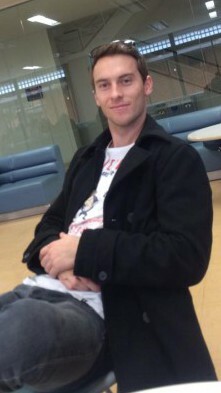 We have a lovely holiday/tour in Japan. We really love it. 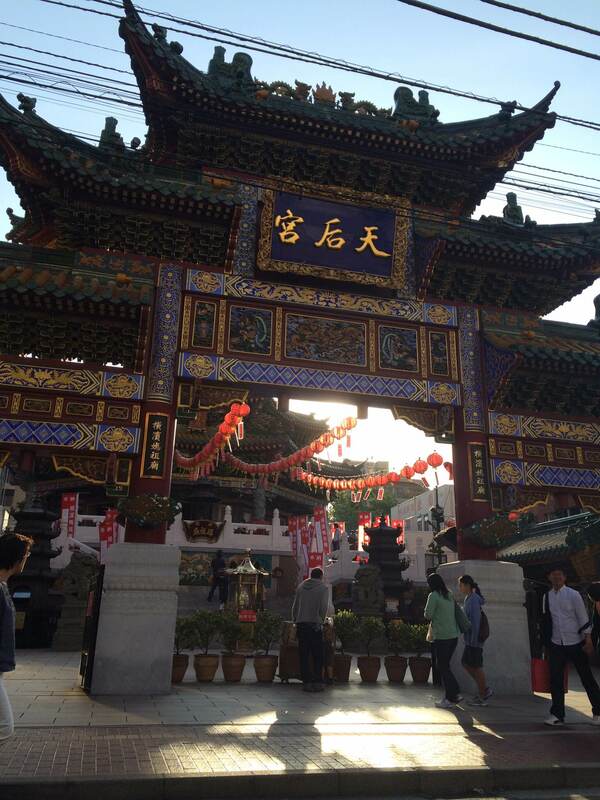 various temples, makes it such a memorable tour. meals and so on. He is so good. you want for the Japanese tour. Please thank him for us when you next speak to him & give him our regards.